Motorists and bus users often complain that people cycling don’t use cycle lanes or cycle paths, below are just some of the reasons why most of these lanes and paths are best avoided some or all of the time. The reasons often can’t be clearly spotted from inside cars or buses. Sometimes many cyclists don’t even know of the risk or act too slowly — a classic example is people cycling too close to car doors on busy roads and getting hit when a driver or passenger swings the door open without looking. So, even when some cyclists use the cycle lane, it does not mean other are wrong for advoiding it. Many cycle lanes are placed in the “door zone” between parked cars and traffic — if you have children or teenagers get your children to practice opening the door with their hand further from the door, which helps with turning around and looking first before opening the door. Because there’s only a cycle lane on one side of the road! 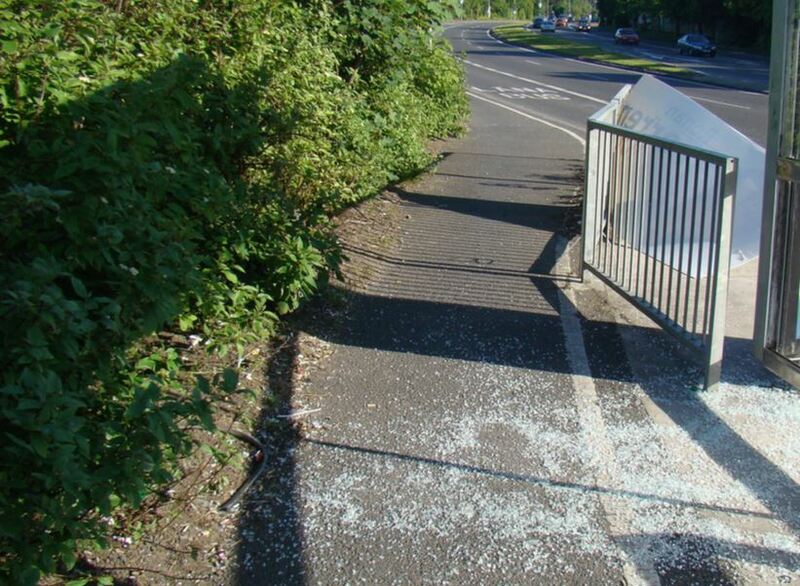 Sometimes glass from bus stops, sometimes from car crashes or sometimes from glass bottles –all can be found on cycle lanes but motorists and people in buses can’t see these things…. Two-way the size of one-way! This is a cycle lane!? 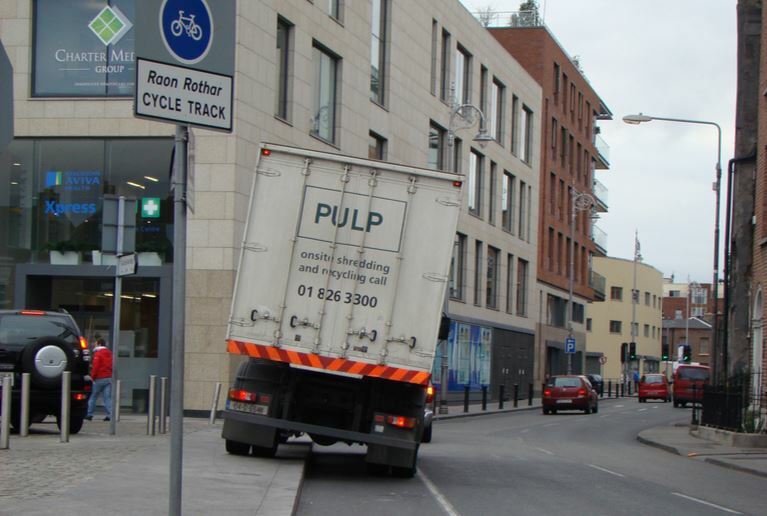 A great suite of images illustrating how most provision for cycling in this country is ‘crap’! Most designers are car drivers and are clueless about cycling. What relevance of National Cycle Manual and Design Manual for Urban Roads and Streets when designers ignore the advice? Where are the road safety audit reports for these schemes? Pretty comprehensive take on the difficult choices facing cyclists in a lot of situations, with a combination of poor design and lax enforcement! BUT…..one of the main issues NOT MENTIONED, and which is a major factor, is the lack of 24 hour cycle lanes…..most cycle facilities are time bound, and related to commuter times! Cyclists need protection at all times! + How often, and more so these days, are we seeing the ‘Cyclists Dismount’ signs at roadworks!? We need more cycle positivity!!! Hahahah, I just ignore cycle lanes….and will continue to do so until they are designed properly. Best advice I have for other cyclists, apart from keeping your eyes peeled and expecting the worst from other people on the road at all times (which is usually the case) is to try and match the speed of the traffic around you, which sometimes means sprinting a little. Mike I think describing the cycling infrastructure in Ireland as “Crap” is unfair to all the other adjectives that could be applied such as murderous, dangerous, thoughtless, careless, useless and pointless to name but a few .When the “designers” take their crayons out to “design” new cycle facilities they are free to ignore advice because the advice should be regulation, which cant be ignored. This light touch approach to design of cycle facilities results in real world, hard touch for the end users with no comeback for bad or absence of design. This is another excellent article by Cian, but I wonder how long would it take to write “25 reasons why cyclists use cycle lanes” or if he could even find 25 pictures of best practice in Dublin excluding greenways. Great stuff. 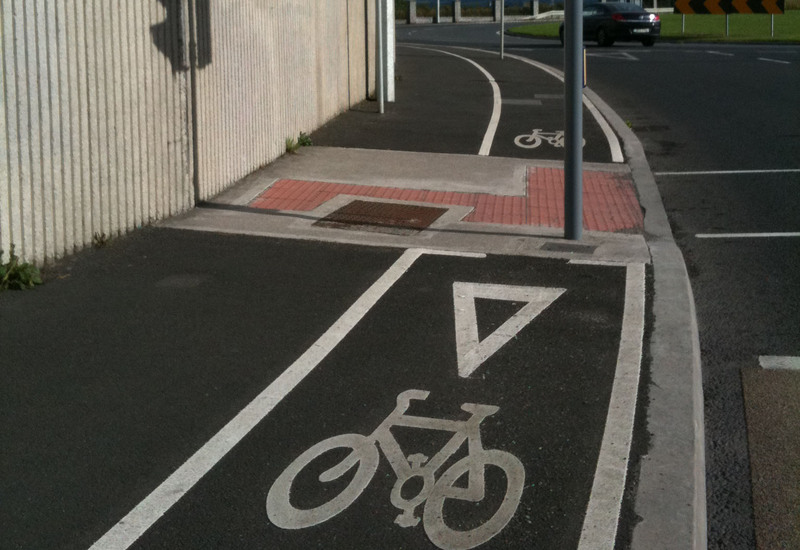 Makes you realise what a shambles cycle lanes in Ireland are. Biggest reason I avoid them (aside from the obvious of cars parked in the way) is because they just aren’t cleaned enough, especially dedicated ‘off-road’ lanes. Like you said, always lots of glass, but general debris and stones and crap which always gives punctures. Sure once the road is swept who cares about cycles lanes! Hi all. Great article! An occurence that you missed is junk left in the cycle lane on purpose: rocks, bottles, broken glass, etc. Good to see junction between Bird Avenue and Clonskeagh Rd made it in “the best of” (4th image from top). Many times I’ve come across this situation. Yes, designers in Transport Authority probably don’t cycle. Why would they? Being a public servant they get free car-parking in city centre, hence the lack of knowledge. It all starts with education. Educating people (kids, parents, drivers) with sense and purpose we will end up having proper cycle lanes like other cities. Folks….lets get REAL here!….and recognise that many of the newer cycle schemes are actually ‘fit for purpose’, and most of the designers are avid cyclists themselves. Sometimes budget constraints limit what gets done in the end! Great that Colm Ryder raised the time-limited period of operation of cycle lanes/tracks/paths/clearways/QBCs. Generally only 12 h continuous period but lots with shorter and varying times. All should be 07:00-22:00 h at a minimum with no variation permitted. A standard period. The reason for the plethora of operational times is historic and due to business, commercial and residential lobbying of Cllrs to enable PARKING! If we are to de-carbonise the Irish transport system this opposition has to be faced-down. The more you encourage parking and fly-parking the more you entice folks to drive to work, shop, etc. Cyclists’ comfort and safety must trump drivers’ convenience. 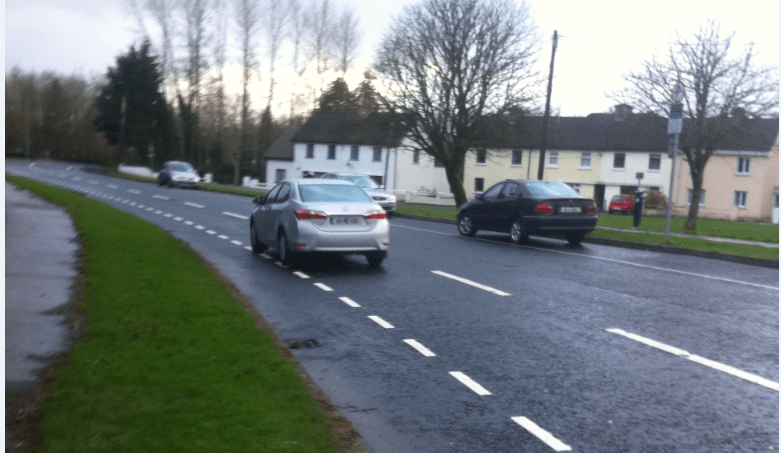 It is part of the paradigm-shift in how we manage traffic that Cyclist.ie – The Irish Cycling Advocacy Network – calls for. There was a cycle track near Lucan that was unusable because boulders had been placed on it at regular intervals to stop Travellers encamping there. Predictably, motorists still harrassed cyclists to use the “perfectly good cycle lane”. Glad to see part-time cycle lanes being mentioned in the comments – these add further confusion to the situation. Regarding following the money – investing in cycling will pay dividends across society in the long run, it’s just a matter of political will and leadership to start implementing existing policy. bicycle lanes are not perfect but we seem to be making an effort to recognize the need for them in ireland, some good ones and dreadful ones in cork city. The issue is there should not be any ‘crap’ cycle lanes/tracks/paths any more because the National Cycle Manual (NCM) and the Design Manual for Urban Roads & Streets (DMURS) exist. Road Safety Audits if performed will then catch the bad design and implementation. We need a root and branch audit on all so-called cycling infrastructure and any sectors found to be sub-standard should be removed/de-constructed. The NTA/DoTTAS/TII need to be more vigilant about funding ‘crap’ designs. @Mike: My understanding is that the national cycle manual, as it is now, allows for too much flexibility. Great to see your articles being published elsewhere! Great to see a Gard who also cycles. I wish more did. Good for you. On your point that people without a drivers licence shouldn’t be allowed to cycle because it’s ‘dangerous’ – that’s just incorrect. How many people have been killed by cyclists in the last 10 years? How many have been killed by cars? I agree that some people on bikes might be genuinely annoying and are assholes but they don’t kill anyone. The annoying assholes in cars do kill plenty of people and just about all of those assholes have licences. Your observances tally with mine. People in cars running red lights seems to be a growing problem (altho’ perhaps it was always as bad and I’m only noticing now). On my commute to work (16km) I see cars running through red lights at almost every junction. It’s staggering how common it is. And also don’t forget the dangerous overtaking, aggressive driving, broken headlights, headlights on full-beam, no head-lights on at all, no indicating when turning, coming too close to cyclists when passing, talking on the phone whilst driving, texting on the phone whilst driving, looking at the phone whilst driving, reversing blindly out of driveways, parking on footpaths, parking on cycle lanes (all the bloody time), not using their mirrors, speeding in urban streets and so on and so forth. And as well as all that, there’s all the noise, smell and danger to health from constant pollution. Why people put up with it all astounds me. Sorry, I also meant to make another point. I’m completely and utterly deaf in one ear. I have to take extra care when out and about because I can’t hear in stereo which means I can’t tell which direction sounds come from. Do you think therefore that I’m dangerous? I have never hit anyone in my life. I have however been run down on a number of occasions and I can honestly tell you that on each of those occasions that I was run down, the car driver was 100% at fault each time. Personally I don’t like to see people cycling with headphones and for their own safety (to give them the best chance at hearing approaching cars) I’d advise them not to wear them. However, they are not dangerous – it’s definitely the cars that are always dangerous. And also, if you are going to stop cyclists with ear-phones then I suggest you also stop motorists listening to the radio. In your story above, you illustrated how the person on the bike with the head-phones couldn’t hear you. Well, have to tried to shout at a person in a car recently. I’ll wager some money that a person in a car listening to music is just as likely not to hear you as the person on the bike with the head-phones. And of those 2 groups, which is the more dangerous? Hint – it’s not the person on the bike. So, next time you’re out and about in the city, i hope you also start flagging down motorists and give them a good talking to about their music. What annoys me is when the road is perfectly smooth and maintained, and the cycle way is full of potholes and bumps. It feels like a lot of government money is spent looking after roads, and cycle ways are an afterthought. I don’t agree that all, or even most, new cycle lanes are fit for purpose. Bad infrastructure is still being built. Where the R338 crosses Belgard Road the cycle lane moves back in to the road for no reason that I can see. For some reason the white line keeps going so at night you may think the cycle lane continues. There is an unlit kerb and a railing across the path in a clearly dangerous design. This bit of infrastructure was put in well after fobbing people off with the excuse that any examples of bad design were old was the standard response. Yield to minor side roads where cars have right of way is annoying but it’s hard to beat the N11 Northbound where the cycle lane is festooned with triangles requiring cyclists to yield to people pulling out of their driveways.